With the 10th Anniversary Celebration in Nashville just a few days away, we wanted to celebrate all the moments that make Musicians On Call the Most Important Gig in Music City. 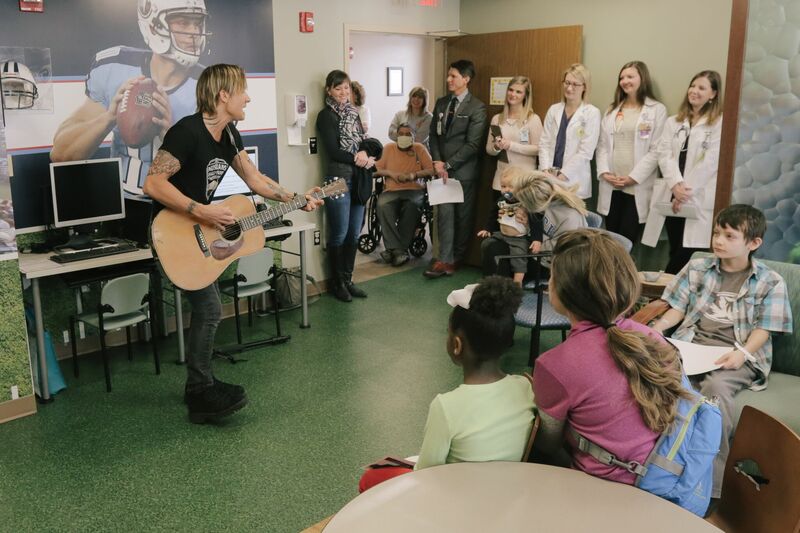 Here are some of our favorite moments from the eyes of the patient that show why exactly we have been bringing the healing power of music to Nashville hospitals for 10 years now. I was facing a very serious heart complication and the doctors were not sure if I would make it through open heart surgery. I did and was very stressed and depressed about the whole situation. MOC showed up and really changed my mood and impacted my stay for the better at Vanderbilt University Medical Center! Thanks so much, MOC! When our infant was having a difficult time waking up from a medical procedure, the musician who visited was the one thing that soothed her for a bit. It is so stressful when your baby is hurting or scared, and it was such a huge relief when something helped calm her. We will never forget that. My son was diagnosed with Leukemia June 2013. He has spent more days in the hospital than out. He has relapsed 2 times. He has had 2 transplants and DLI. We were in the hospital this time from complications from GVHD. He is so tired of being sick. He is feeling down. He is 20 years old and should be having the time of his life. I haven’t seen his sweet smile in months. You and Keith Urban brought that smile back if only for a moment. That alone has meant more to me than any words could express. (It helped me too to get to meet Keith). Thank you so much for putting a smile back on Brandon’s face and mine. What a wonderful experience! Alyssa sang to the 2 veterans as if it was their own personal concert and she was so proud to be the entertainer. My dad called his friends to share the experience. How thoughtful and giving! A great program. And a very pleasant surprise. My son has been in the Hospital since the 8th of October, and we got a visit from an artist by the name of Kristine on October 17, 2016. It was an absolutely lovely performance and experience. My son had a laugh and smile on his lips for the whole thing! He loved it! Thank you so much! I was having a really rough bone pain day since I have brittle bones and the weather is changing. I truly was dreading being at Vanderbilt ALL DAY(9-4:30). I’m always thankful and remind myself it could be worse but sometimes it’s just hard to always be in a hospital for one reason or another. I am a big believer that music heals not just emotionally but physically too. When I found out Kelly Clarkson was going to be in the hospital I begged my nurses to allow me to go see her(oncology normally doesn’t allow it) and Rhett allowed me to go down and see it! Honestly it was a once and a lifetime experience! Between paying medical bills and travel expenses, it’s hard to afford concert tickets and no way I could ever meet and greets with her! While setting there listening and started singing along and forgot why I was so upset that morning when I started out there, then I felt like I had more energy! Like I said I’m a big believer in music heals and MOC is such a great organization for that! It is so stressful and an emotional time to see your loved ones suffering. This lovely sweet lady came to my sons room and completely uplifted my spirits and also his! With just one song! So amazing, so talented. I would absolutely love to have another visit. This was like a breathe of fresh air. Thank you and thank you Whit. You are an amazing and talented singer. I’m sure you will go far. On November 30th 2016 my wife was in a serious car accident. She was in a coma at the Vanderbilt Trauma Unit, 10th floor for several days. One day (I believe it was around either the 6th or 7th or the 13th or 14th) a young lady with a guitar was coming around the unit and ask if she could sing a song for us. The song was perfect! That was the first time since the accident that my emotions got the best of me. My wife is now home from the hospital, thank God! Recently, as we reflected on the event, she didn’t remember much while in the coma. However, she did remember someone singing. As an evening shift charge nurse, we have MOC come almost every Thursday night. This is such a wonderful program for our residents. Our unit is half long term care and half restorative. 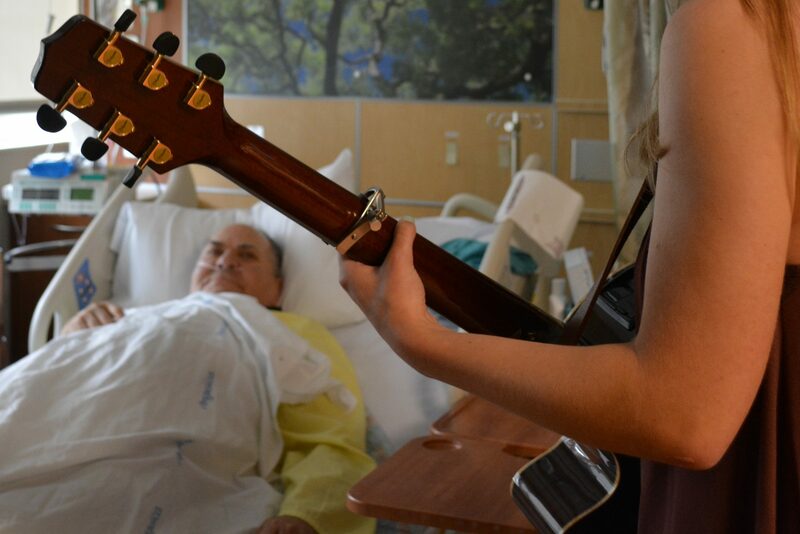 I have seen musicians rekindle their interest in music after a debilitating event and agitated residents calmed. I could go on and on about the benefits of this program. Thank you from myself, my staff and my residents! I was admitted to the Nashville VA Hospital on June 9th for open gallbladder surgery. Four or five days afterward, a young lady came into my room to offer up a couple of songs. With a pleasant alto voice and excellent guitar skills, that experience was the highlight ~ I would do well to say the only highlight ~ of my 6-days’ stay there. It was pure magic! 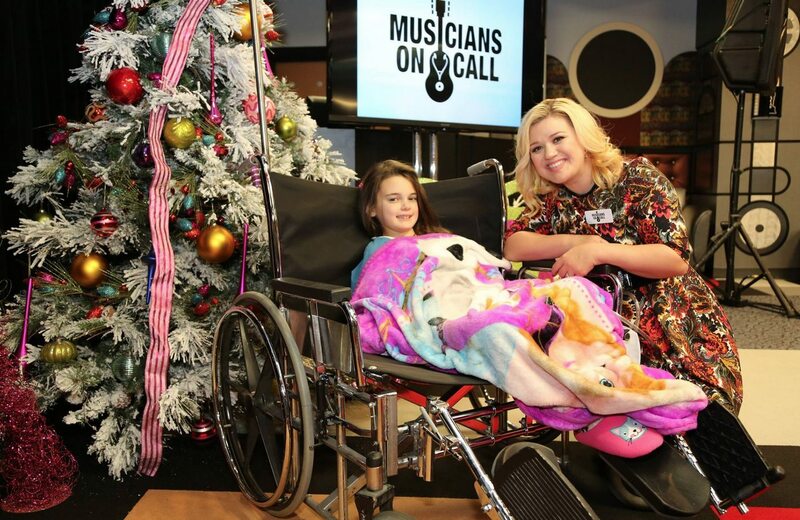 Thank you, “Musicians on Call” for sharing your wonderful talents. Thank you to everyone who has helped make these and all the Nashville MOC Moments happen over the years. Have you been a part of the #MostImportantGig in Music City? Share your favorites on the social media platform of your choice with the hashtag #MostImportantGig! Tickets are almost sold out for our 10th Anniversary Celebration! Be sure to get your tickets before they disappear!